such that ALAIN comes out as ADAAF. 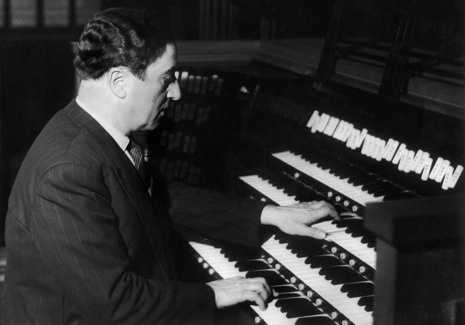 In the final section of the Prélude, Duruflé quotes the theme of Alain’s most popular work, Litanies. The double fugue is a stunning example of contrapuntal writing. The two fugue subjects are expounded separately in compound time: the first is written in quavers, the second in semiquavers. The composer uses the first fugue subject in inversion and stretto; the tension is heightened by closing the distance between the subject entries of the stretto, and the whole ends in a blaze of glory. This is the Prelude from Maurice Duruflé’s Prelude et Fugue sur le nom d’Alain, a work written in anguished tribute to a fallen colleague, French organist, composer and war hero Jehan Alain (1911-1940). Alain was among many French fighters evacuated from the Dunkirk beaches alongside the British Expeditionary Forces, whom they had been assisting. These French servicemen were then processed through the former Royal Victoria Patriotic Asylum in Wandsworth, South London, which was by then an MI6-run clearing camp called the London Reception Centre. Alain volunteered to return to France: a skilled motorcyclist, he became a dispatch rider in the Eighth Motorised Armour Division of the French Army. On 20 June 1940, he was assigned to reconnoitre the German advance on the eastern side of Saumur, and encountered a group of German soldiers at Le Petit-Puy. Coming around a curve, and hearing the approaching tread of the Germans, he abandoned his motorcycle and engaged the enemy troops with his carbine, killing sixteen of them before being killed himself. He was posthumously awarded the Croix de Guerre for his bravery and was buried by the Germans with full military honours. This recording is taken from an old 1970 LP – long out of print – called “Modern French Organ Music” which was recorded by André Isoir (b.1935) with Jean-Claude Raynaud at the Basilica of Saint Sernin in Toulouse. This recording is doubly interesting in that it gives an insight into the sound of the 1888 Cavaillé-Coll organ at Saint-Sernin before the somewhat controversial restoration of 1996-97. I do not seek to take sides in that particular debate and ask that you please refrain from stirring up further controversy. Enjoy the music! A particular thank you must go to American theatre organist Llewellyn (“Lew”) Williams (of the Organ Stop Pizza restaurant, Mesa, Arizona, with its four-manual, 78-rank Wurlitzer), who sent me this fantastic recording.